I was somewhat dissapointed with the work due to the water leaking in my newly installed furnace. If I had not called to get my inspection it would have probably leaked for a long time causing some serious problems. A repair man came out today and did the repair on the furnace. I hope I donot have any further problems since this is a brand new furnace. 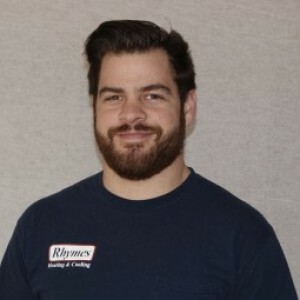 I have had the pleasure of having Rhymes Heating & Cooling service my needs for well over 15 years. They have excellent service. On my most recent call for service (1/10/18) Darren N. of the office staff handled my call professionally and made the appointment time to fit my needs. Darren took all of my information and listened to my concerns. He reassured me that the technician would call me when he was on his way. Service Technician Mike V. responded on time and immediately took care of my complaint in a professional manner. Mike explained what he had to do to fix my problem of no heat. Both Darren and Mike are very courteous and professional which make any call for service to Rhymes a pleasant experience. I highly recommended Rhymes Heating and Cooling to all my friends and relatives. ****** was very kind and efficient in helping scheduling a team member to come to my house to address the problem with my furnace. He communicated throughout the process and even ordered the needed part to be shipped overnight. Much appreciated as it was pretty cold outside and inside! Thank you! I can't say enough good things about this company. Over 14 years ago our very old furnace went out shortly after we brought our new baby home. We had a lot going on...and a new furnace wasn't in the budget, but Rhymes helped us determine in the long run, a quick fix wasn't a smart move financially...and they were correct. Fast forward to this morning on the tail end of some of the coldest days and nights I can remember when I wake to find my furnace didn't work. I called them first thing as they have serviced our air and furnace! Darren got us squeezed in on the schedule and Adam arrived mid day, greeted our dog, and went to assess the issue. He figured it out quickly, but the part needed to be ordered and they could install tomorrow. Luckily, Adam put in a good word for us and Darren was able to find the part, called me back quickly and Mike came late afternoon to install! We have heat! They have come through in a pinch for us a few times! Great service, great people. Making an appointment is always easy. Frank is knowledgeable and efficient and friendly. Called early morning and spoke with Darren. He was incredibly helpful and gave me all the information I needed! Scheduled Adam to come out and he was at my door in a little over an hour. He called ahead to let me know he was on his way. These guys are fantastic with great customer service. I was not an existing customer when I called, but they will be my HVAC team from now on! Thank you Rhymes! Our furnace man did a great job. Very nice and efficient. I have been during business with Rhymes for 15 years. They have replaced my a/c and furnace. Every time they have done excellent work. I would recommend them to anyone. ****** *** **** were very informative and cooperative in booking my appointment performing the service. Rhymes was great. Fast, professional and easy to work with. I'm not positive I remember the cost correctly. We purchased the yearly check up package that included a fall and spring check. It was fine. This is the company that installed our new furnace and air conditioning two years ago. They were professional and timely. We will continue to use them. Repaired the upstairs cooling unit that was located within the attic. Service was outstanding. Upstairs air conditioner went out in the morning and they sent out a service technician, Frank, right away. There was work done on the unit twice last year but the work done was by two other companies (they were sent by the homeowners warranty insurance co). Now without a policy and free to choose my service provider, I picked Rhymes because they were family owned and I grew up in a family business and good families tend to do good work. I immediately noted the difference with Rhymes. Frank was very professional in all aspects and was able to quickly diagnose the problem and ordered the parts for the repair. While waiting for the parts, he patched the unit together to get it running until the full repair could be done. He returned later in the day and installed the new piece and was out the door by 4pm. He was great about answering all my annoying questions about new unit options, costs, how to get it up there etc...even though he doesn't do installations. Unit is working well now and is upstairs just humming away. Yes, Rhymes the repair seemed pricey, but skilled/professional employees and quality parts don't come cheap. I would rather pay slightly higher price for the all around top quality service I received than to get by cheap with anything less. I became a loyal customer today and will certainly hire them again in the future. What really set Rhymes apart was the quality of the technician. Other companies were able to fix the problem but they didn't have the level of professionalism Rhymes had. I'm picky about the people that work on my home and I will stay away from the home warranty so I can keep the freedom to choose professionals like these. Annual service call on 2 air conditioner units; added coolant to one of the units. Service was as expected as I've had the company out annually for several years now. They were prompt, explained issues they did (needed coolant in one unit)or did not (all other parts of the system were operating correctly) find with my system and what needed to be done to keep it running optimally. Also, cleaned up any areas before they left. I used Rhymes Heating & Cooling to work on our air conditioners. They did good! They did what they said they were going to do. Their price was reasonable. They were efficient. Rhymes is very easy to work with. When I called the office to ask about this service and prices the people I talked to were very friendly and polite. they quickly and easily answered my questions and worked with me to schedule the service. On the day of the service they arrived at the scheduled time. They were polite and friendly. They were careful to cover their shoes to protect my carpeting. They technician was happy to answer my questions and to remind me how to turn off the humidifier. The work was finished in a timely manner and thoroughly.